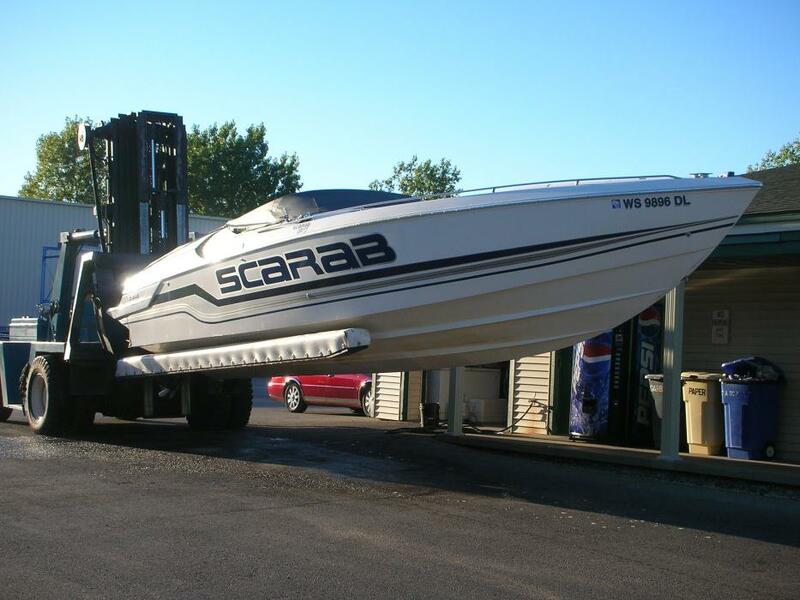 1998 Scarab Sport 34 Need to sell ! Great Condition ! All offers welcomed ! 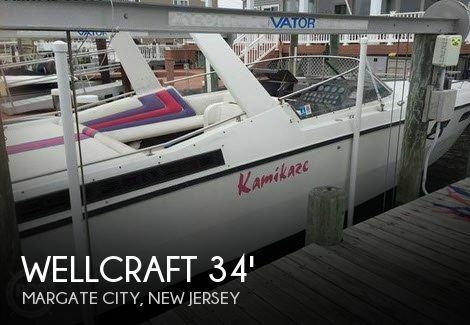 1990 Wellcraft Scarab 34 NEW GRAPHICS!!! AND 496 MAG REPOWER!! RARE! !ALL NEW GRAPHICS!!! GAME CHANGER! !Nice, Scarab powered by 496 MAGS W/ BRAVOS. RARE TO FIND WITH FACTORY REPOWER!! Awesome boat!!! 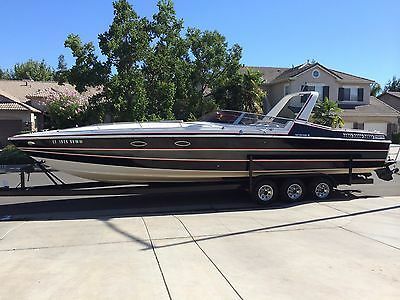 This Scarab 34 Excel is a piece of power boat history. Call 916-782-4414 or stop by Thunder Bay Marina on Grand Lake to take a look. The boat has newer 502 engines and outdrives, the exact year of the engine is not known at this time but will be updated as soon as possible. Also, there is new upholstery. The boat had just finished getting serviced when I took the pictures. It is getting detailed and buffed and I will then take new updated pictures. Stock #084303 ORIGINAL OWNER. NEWER ENGINES AND DRIVES,REPAINTED AND REUPHOLSTERED. 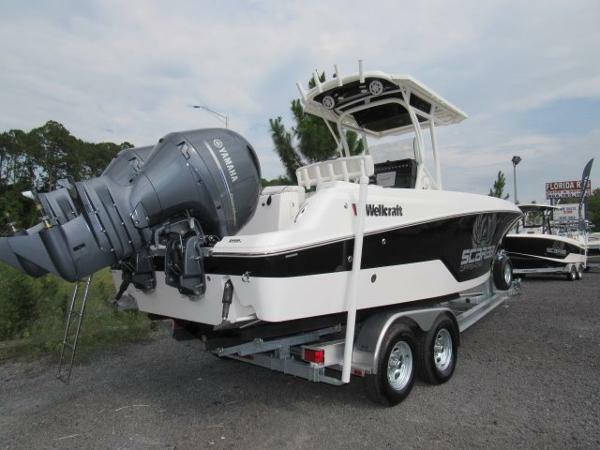 If you are in the market for a high performance boat, look no further than this 1984 Wellcraft 34 SCARAB III, just reduced to $25,000 (offers encouraged). 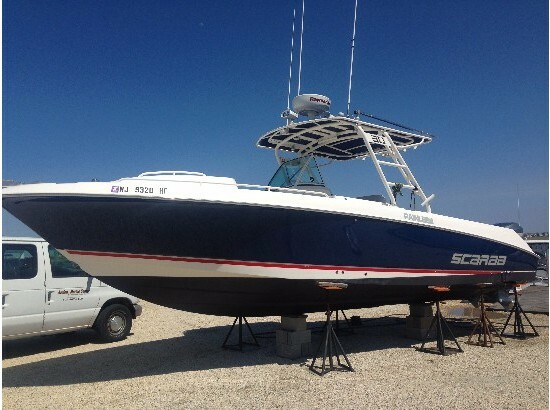 This vessel is located in Margate City, New Jersey and is in good condition. 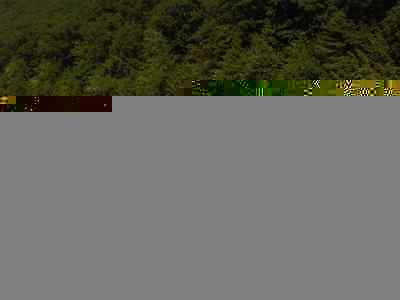 She is also equipped with twin Mercruiser engines that have 500 hours. Reason for selling is seller doesnt use it anymore.. 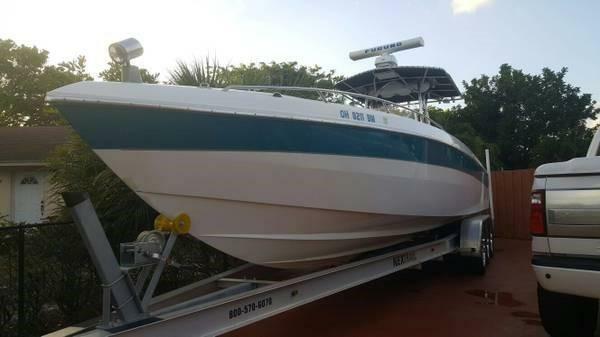 Per the seller, this boat has never had any issues functionally or cosmetically. All gauges, electronics, and engines are working like new. The boat appears spotless with a shiny hull, clear gauges, firm and flexible cushions, clean carpet and storage lockers. One blower motor switch needs to be replaced. The switch is included with boat new in package. Needs to be installed. Stock #145831 Boat is in EXCELLENT condition. Only used in FRESHWATER. Ultra LOW PRICE! 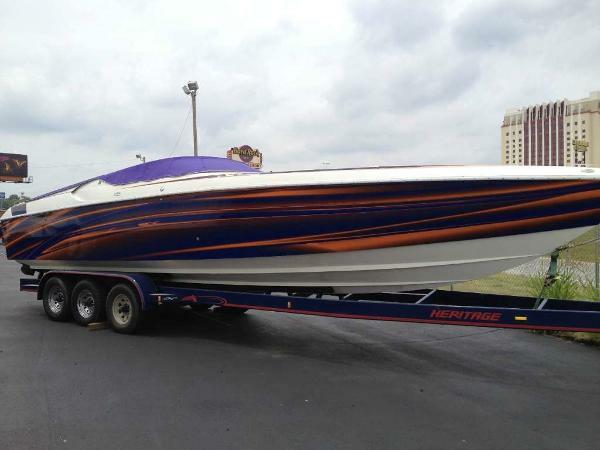 If you are in the market for a jet boat, look no further than this 2015 Scarab 215 HO, just reduced to $34,500 (offers encouraged). 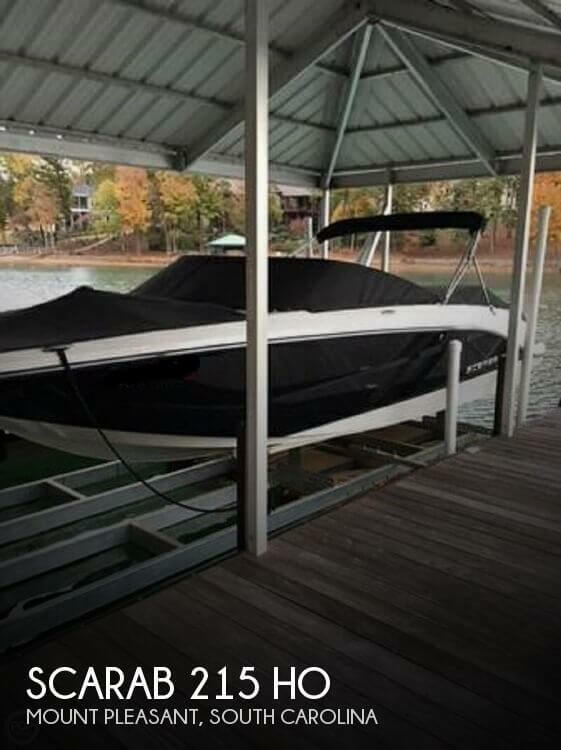 This boat is located in Mount Pleasant, South Carolina and is in great condition. She is also equipped with twin Rotax engines that have only 70 hours. Reason for selling is owner buying larger. 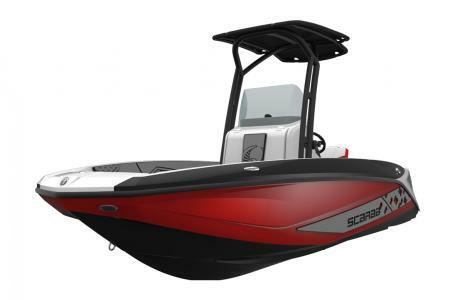 2017 Scarab Open 195, Scarab Factory 'STARTING AT' price with 250hp $34,146 plus freight and optionsFactory 'STARTING PRICE' is the lowest allowed internet price of the base boat PLUS freight and options. Scarab does restrict the internet advertising of dealers out the door pricing. Please contact us for your final out the door price to include the freight and options. We do discount freight and options ! !Stock Boat Options :T Top Folding with CanvasConsole and Helm Seat CoverDepth SounderPorta PottieBow Seating PackageAft SunpadCockpit CoolerDigital Speed ControlMarine Mat, CockpitMarine Mat, HullMarine Mat inside TailgateScarab Single Axle trailer with Brakes, swing away tongue and Aluminum Mag WheelsPlease call for our out the door price with the above options. We do discount freight and options.SpecificationsApprox. Boat Weight: 2730 lb. (1238 kg)Beam: 8 in. (20 cm)Bridge Clearance: 3 ft. 10 in. (1.2 m)Bridge Clearance w/Top: 6 ft. 2 in. (1.9 m)Deadrise: 20 deg.Draft: 12 in. (30 cm)Fuel Capacity: 31 gal. (117 L)L.O.A: 18 ft. 10 in. (5.7 m)MaxHP: 250 hp (186 kW)Maximum Capacity: 1400 lb. 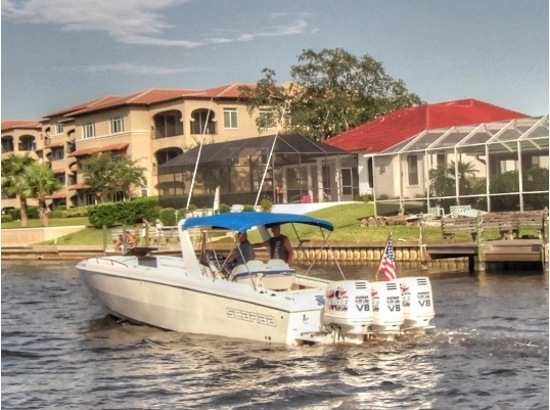 (635 kg)Persons Capacity: 8Hull & DeckBow and stern eyes, stainless steelCleats, pull-up, stainless steelFiberglass stringersMarine Mat, swim platform & exterior tailgateTailgateHorn, stainless steelMeets applicable USCG & Canadian Regs; NMMA Certified using ABYC Stds.Navigation lights, L.E.D.Rub rail, w/ stainless steel insertSwim platform, reboarding ladder, stainless steelThru-hull fittings, stainless steelWindscreenSwim platform mat(s), soft stepStern reboarding ladder, stainless steelTow SportsSki tow, sternCockpitAnchor storage, under bow seatAssist handles, stainless steelSelf bailing cockpitBeverage holders, stainless steelCooler, built in, bowCourtesy lightsFiberglass liner, skid-resistant, with stainless steel drainsSeating, flip-upsSeating, forward consoleSeating, helm benchCasting platforms, aftHelmLighted switchesEmergency engine shut-offOutlet, 12VScarab custom gauge clusterStorage for small electronicsTilt steeringEntertainmentStereo systemEngine/SystemsWeedless shaft guardClosed loop coolingLateral thrust controlIntelligent Neutral & ReverseTrailerScarab custom trailer, painted, brakes w/chrome wheels & swing away tongueTrailer brakesHead and ShowerEnclosed Changing RoomNOTES:Images shown may contain optional equipment. See your dealer for details.